On Tuesday, July 28th, I went to my favorite art venue, the Laguna Beach Art Festival. This is a wonderful open air event that includes 3 separate art venues spaced along Laguna Canyon Road, each with restaurants, food booths, demonstrations, hundreds of paintings, sculpture, jewelry, pottery, photography and clothing. The oldest of the venues, the Festival of Arts, was originally held on the streets of this little beach town. Today, its beautiful location is permanent. Not only is the art at this location juried, but you have to live within a certain distance of Laguna to qualify for entry. 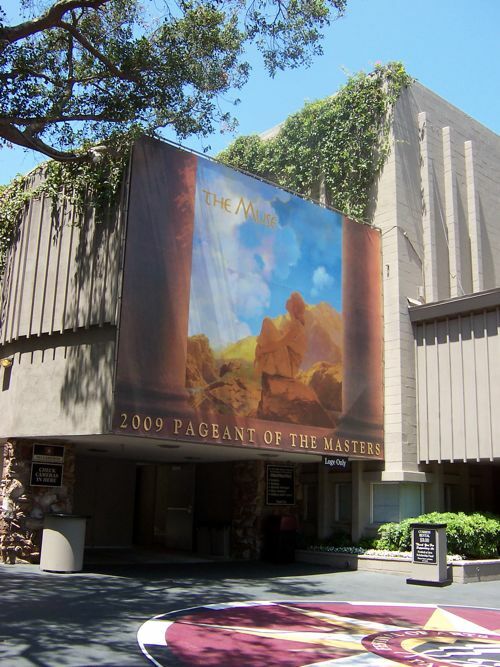 The grounds holding the art booths are attached to a theater that shows well-known art work produced in the evenings on stage with live actors called the Pageant of the Masters. The top photo is the entrance to that theater. 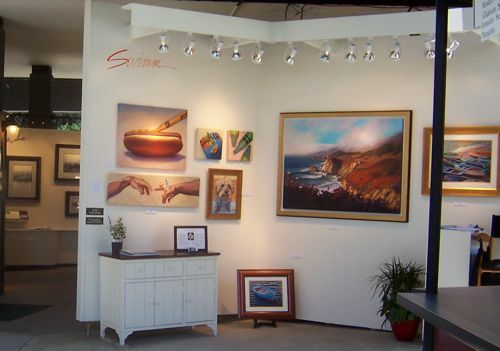 A short distance along the canyon road are two more venues, Art-A-Fair (juried, but not limited to local artists) and the Sawdust Festival (not juried, but artists must live in Laguna Beach). Although photographing the art is not allowed in any of the venues, you can take general shots and I see that I got a pretty good shot of a booth at the Festival venue. As you can see, the lighting is wonderful and all booth areas are covered, so the July and August sun is held somewhat at bay. I hope I can go down again before the end of August. In the meantime, it’s back to my own art! It is always an over-whelming experience for me to drink in the amount of art on display each year. Talking with the artists is a plus, as most can be found at their booths on the weekends. Since I was there during the week there were fewer artists, but no real crowds, so I could get wonderful views of everything in the booths. Yes! A blue ribbon from my first Art Show entry and an Honorable Mention! The show was sponsored by the Lakewood Artist Guild. 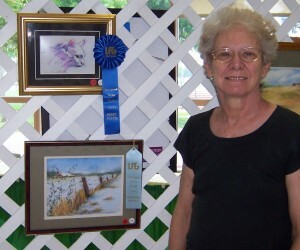 Through the years I have entered many quilt shows and have several ribbons, but this was a total surprise for my first Art Show. Judging was done by a professional artist (not somone affiliated with the Art Guild and both entries were in a category called “Other/Mixed Media” Other categories were the standard Oil, Acrylic, Watercolor, Photography, and Digitally Enhanced Photography. 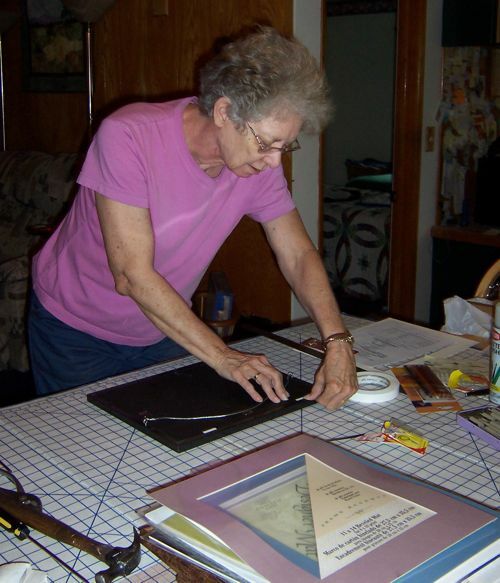 Pastels, Drawings and Mixed Media were judged in this catchall category because they want a leas 7 entries in any specific category. 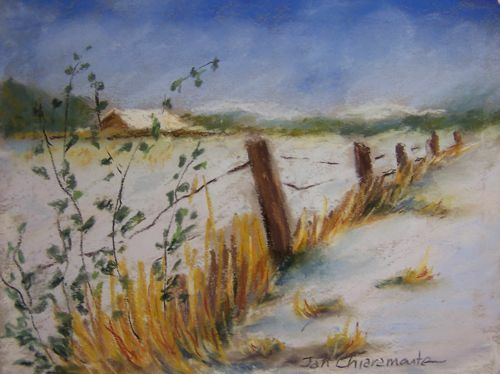 The blue ribbon is for the Ink and Wash Drawing call “Le Chat” and the Honerable Mention for the pastel landscape called “Utah Snow”. Here are the other two pastels that I entered…..50% ain’t so bad, is it? AND the $50 cash prize helped pay for materials. I was on cloud nine for a long, long time! 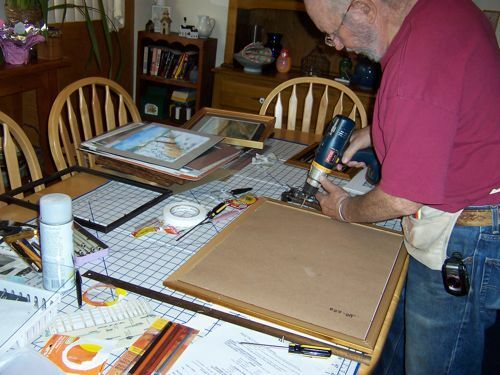 The Lakewood Artist Guild scheduled their spring show for May 28th through 30th. 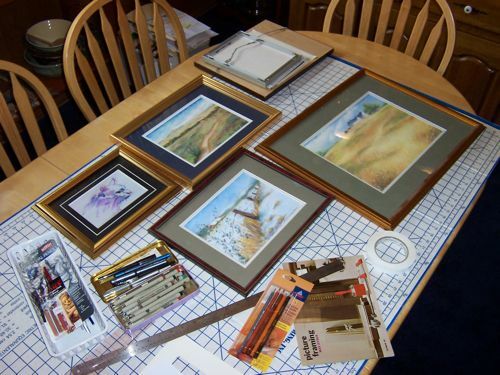 Guild members could submit up to 4 paintings (sculptures or crafts) for a very nominal fee. I choose three pastels and one ink and wash drawing for submission and they were all accepted. I thought I’d show you the relative sizes of these paintings. I think they’ve all been posted before with their dimensions, but I think this gives you a better sense of the sizes I usually work in.